Winterscales Beck is a major stream collecting water from Blea Moor and Whernside, but it has significant links with Ingleborough as it is the origin of the River Doe, flowing through the great glaciated valley of Chapel-le-Dale; a feature synonymous with Yorkshire’s most famous mountain. Haws Gill Wheel on Winterscales Beck – where the water sinks into boulders in a depression, forming a small lake in flood conditions that overflows down the normally dry bed towards Weathercote. Stephen Oldfield. In its early stages, the beck plays a puzzling game of hide-and-seek; appearing one minute and sinking the next. At the big depression known as Haws Gill Wheel (SD745783), the underground water emerges from a series of short caves before sinking into its rocky bed, but in flood conditions a dramatic lake forms. 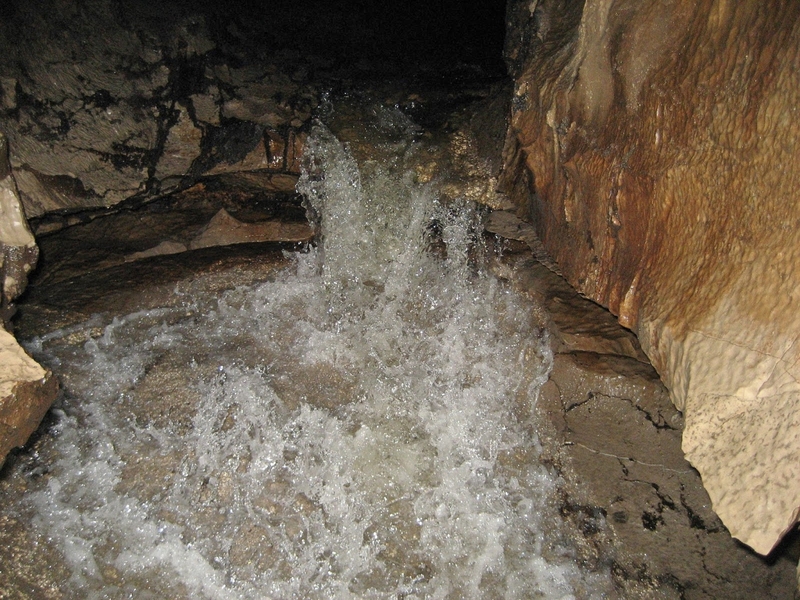 Though water still sinks beneath it, some overflows down a normally dry stream channel and towards the famous Weathercote Cave. This was the second waterfall at Weathercote, famously painted by Turner during a flood in the early nineteenth century. In normal conditions, however, the stream (now known as Chapel Beck) approaches Weathercote already underground, emerging as the dramatic 26 metre (77 foot) main waterfall down a fault guided joint before promptly disappearing; to emerge a kilometre later at God’s Bridge. This is the rising for most of the main cave and pothole systems on the north eastern flanks of Chapel-le-Dale, and is an unforgettable sight in flood. 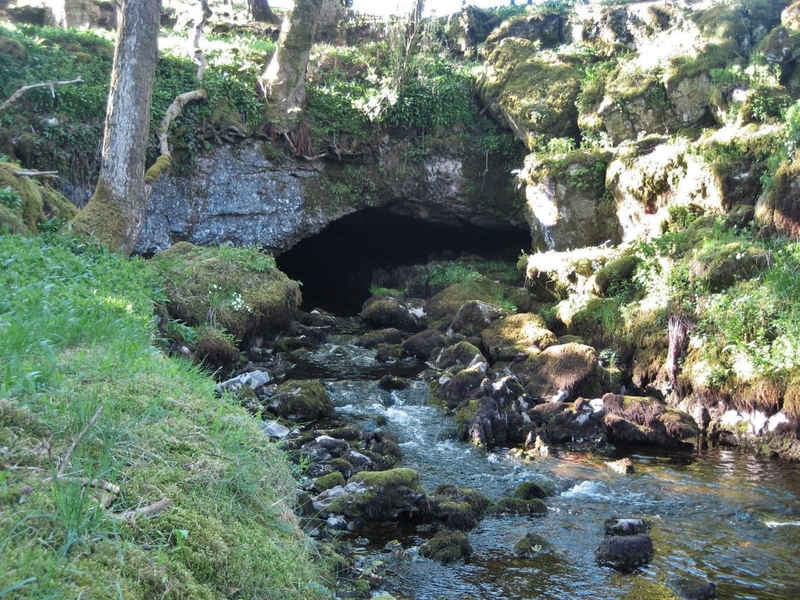 Gatekirk Cave lies above Haws Gill Wheel and its short but dramatic main chamber streamway forms a tributary to Winterscales Beck. 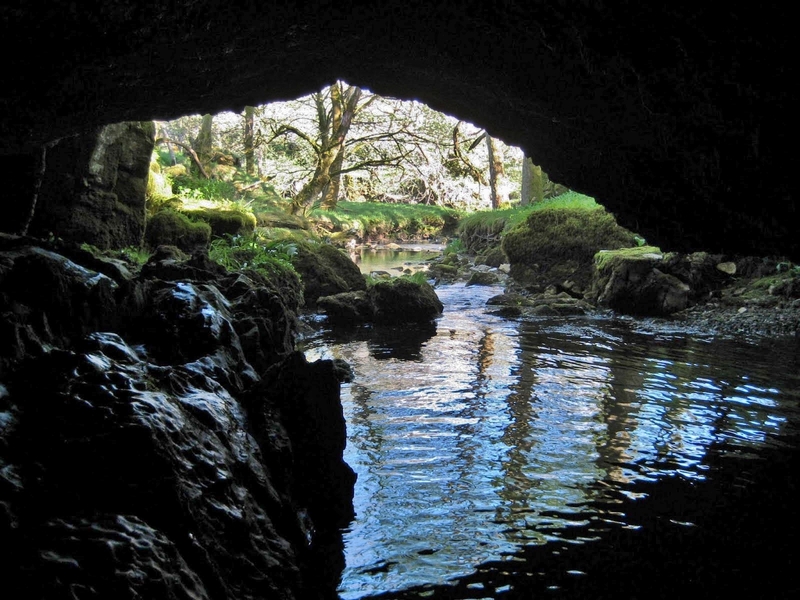 It is a mysterious little cave, as the origin of some of its water remains unknown. 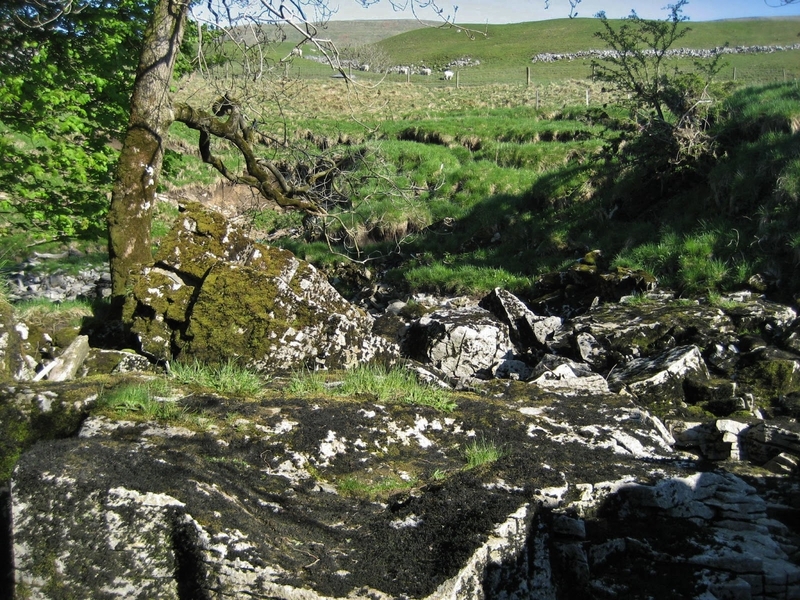 It is largely suspected to come from sinks on the lower slopes of Whernside, but apart from some tested points along Winterscales Beck, the actual links have not been proven. They are suspected to come from Daimler Hole and Bruntscar Cave to the north-west. 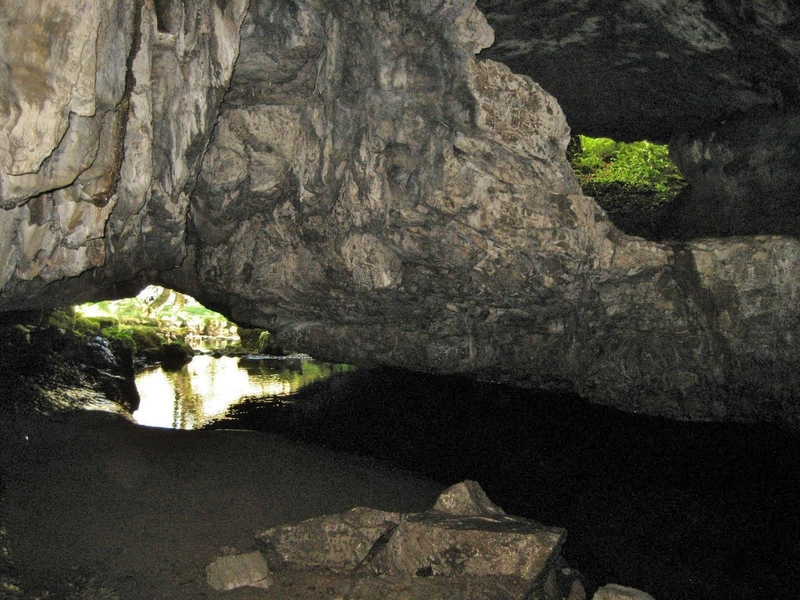 The cave fills to the roof in its upper sections and is dangerous in flood. Even in normal conditions the limestone walls seem to vibrate and tremble as the beck thunders through this quaint yet awe-inspiring place. 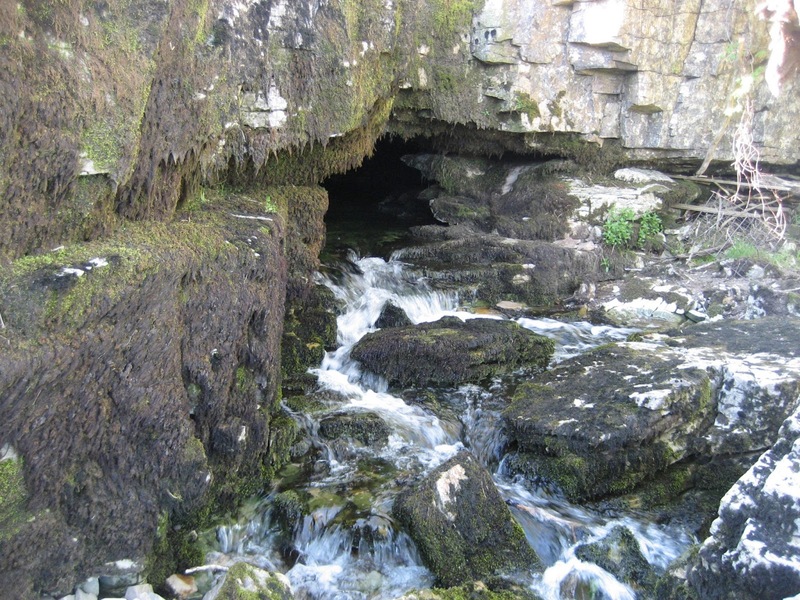 The lower entrance, from which the main flow resurges, is one of the most beautiful cave mouths in the Three Peaks, fringed with mature trees and decorated with rich, lime-loving vegetation. Wading inside, the passage opens out into a large chamber with a noisy cascade at the far end, and an abandoned former exit up on the left, known appropriately as ‘The Loft.’ This indicates the former level of the stream exit before the beck cut deeper through shale layers into the limestone – finding a new way out into the daylight. 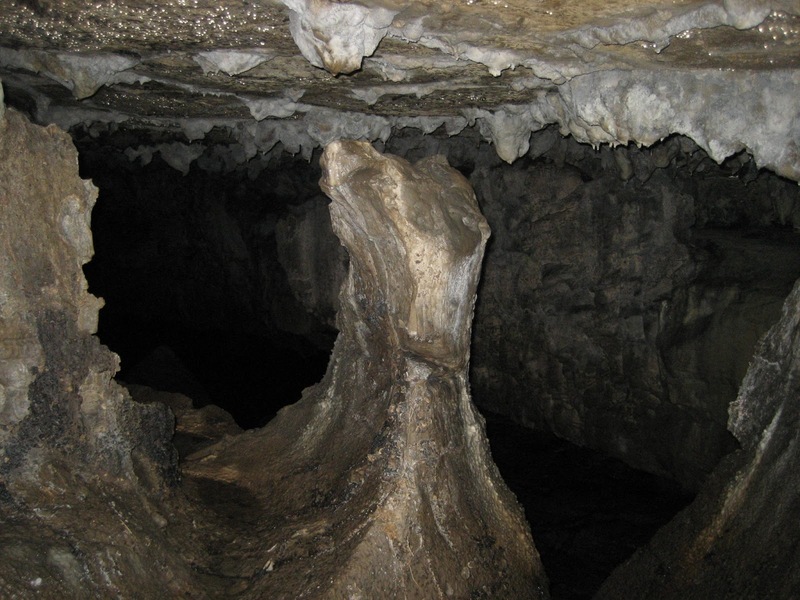 A spectacular rib of limestone divides the ‘balcony’ in Gatekirk Cave. Stephen Oldfield. A raised balcony of rock flanks the main chamber to the right, again a former floor level, while a branch off the main streamway leads up through fallen blocks into daylight. To the east of the main chamber are a series of dry passages active only in flood, including beautifully scalloped walls and a distinctive limestone ‘mummy’. ‘Gatekirk’ is a good name as the visitor enters a subterranean church, although a perpetually troubled one – with its own crypt and tomb effigy. It remains a little-known secret for the limestone connoisseur.